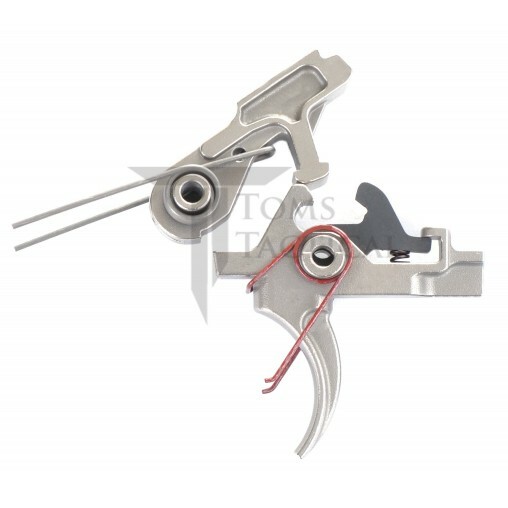 The Toms Tactical Premium 2 Stage Nickel Boron AR15 Trigger Group is 100% made in the USA and features a smooth two stage 4.5 lb trigger for precise and accurate trigger control. The trigger pull consists of 2 stages, the first stage is a 2 lb pull which brings to to a "wall", then the second stage is a short 2.5 lb pull. The trigger resets at the wall, allowing for predictable accurate follow up shots. The nickel boron coating provides enhanced durability and corrosion resistance. Engagement surfaces on trigger and hammer are precision polished to give you a crisp trigger pull. This kit will work with any mil-spec AR15 lower receiver. Installation is similar to a mil-spec trigger and can be done in minutes without special tools. All Tom's Tactical brand products include a lifetime warranty. Does not work with 9mm or 45acp ARs. Im a big fan of nickel boron triggers, though this is my first 2-stage trigger, and I have to say I am super impressed, this trigger is amazing! This review is overdue. Received the Nickel Boron Trigger and I have to say this is a trigger better than some other triggers I have on my other firearms. This two stage trigger has a smooth front to back trigger pull. I was quite impressed, for me this trigger had minimal pull to the aim and then add a little more pressure the next two pounds and the trigger breaks and it does not feel like a 4.5 LBs of pressure, almost like air. Extremely satisfied as I was shooting 5.56 68 Grains from Freedom and then reloads at 62 grains and the reloads faired better than the brand.